The site of one of the most sensational - and sensationalized - serial murders in history, Hrad Cachtice stands now empty and mostly ruined. In 1611 the household of the Hungarian countess Elizabeth Bathory was accused of torturing and killing as many as 600 young women within the walls of this castle. Over time, the story began to include accusations of sexual attacks and turned Elizabeth into a aging beauty obsessed by the idea of eternal youth found in the blood of virgins. Now perhaps irretrievably mired in myth and speculation, it may be impossible to completely separate fact from fiction. This much we know: Elizabeth was real, and died here. 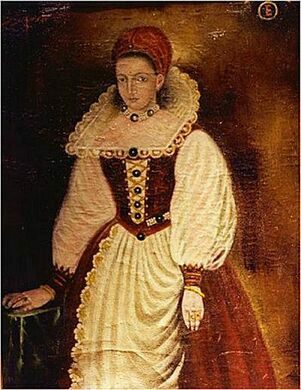 She was part of the powerful Hungarian Bathory family, and something went very wrong here in the early 1600s. She was married in 1575, as part of an arranged marriage at the age of 14 and received the Cachtice castle property, along with the surrounding feifdom of 17 villages as a wedding gift from her husband. 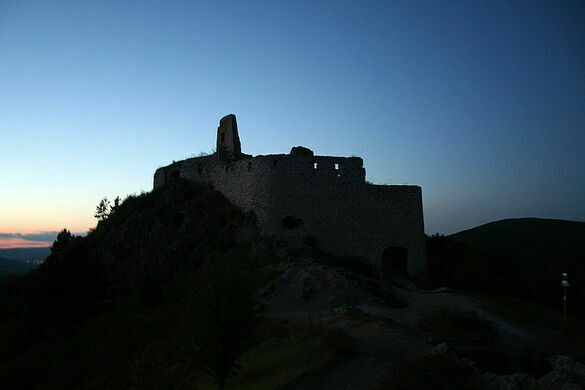 The castle itself dates to at least 1276, when it was mentioned as a border protection fortress. In the early years, they seemed to be more or less a normal aristocratic family - he fought in battles far from home, she hung around the various family properties and eventually bore three children. Although there were a few strange accusations in the early 1600s, things did not get really weird until after her husband’s death in 1604, when she permanently moved to the castle property. Allegedly the routine (yet brutal) punishments of servants escalated into torture and death for minor infractions. A taste for violence led Elizabeth to send her loyal staff into the surrounding villages and countryside to lure young women to the castle, where they often met with grisly ends. When the locals started to wise up and refuse to let their daughters and sisters go to work at the castle, Elizabeth hit on a genius idea: in 1609 she opened a school for lady’s etiquette, then known as a Gynaecaeum. Young women from far-flung noble families began to arrive to receive instruction in the womanly arts from the aging widow. But it was this decision to become involved with noble families that was her downfall, as young ladies went missing, their angry fathers and brothers began to notice strange goings-on at the Castle Cachtice. In 1610, her castle was visited by local authorities, who reportedly discovered injured and dead young women on the property. Her three loyal collaborators were immediately seized and imprisoned. After what has been described as a show trial, the two female collaborators were executed in 1611, their fingertips pulled off with pincers before they were thrown alive into a fiery pit, which shows that the standards of the times were not so far off from Elizabeth’s own predilections. The male servant was beheaded and then thrown into a pit. There is speculation that the force of the trial may have been amplified for political reasons, with opportunists taking advantage of the opening to seize property and wealth from the Bathory clan, particularly since Elizabeth stood alone as a widow. The records also seem to indicate that Elizabeth was not specifically named herself as the perpetrator of the crimes, instead her household was implicated, perhaps out of deference to her status, and the possible embarrassment it would cause to other members of the nobility who had consorted with her. Elizabeth was placed under house arrest, walled in a tower of the castle, while the trial of her servants commenced. She remained there in isolation for four years, fed through a slot in the wall, until she was found dead in 1614. She was originally buried in the local cemetery, but due to local distaste, she was moved to her family home in Ecsed, Hungary. In the following centuries her story was alternately forgotten, and then sensationalized. Speculation has turned her into a lesbian vampire tyrant who sought eternal youth through the blood of virgins, but the truth seems to be gory enough without the supernatural trappings. The castle was abandoned in 1708, and is now in ruins. Visitors can hike up to the ruins from the town of Cachtice, where there is also a small museum in the main square, and the church where her body was originally interred. A perfectly preserved hill village where the buildings are painted like white lace. A mesmerizing landscape of 18th-century cellars carved out of the land.